We have just updated SlashCV with brand new PDF templates! There are now 27 new templates you can use. Choose the one that works best for you! In addition to the new templates, you can now format text, drag and drop sections to re-order them and edit section headings. We have a small demo on our new homepage. Please do check it out! In addition to the new features, we have also done away with a couple of old features -- Profiles and CV Feedback. Since not many people were using them, we thought it best to hide them :) We hope to bring a version of Profiles to the android app we will be building soon! We hope you like what we have done to improve SlashCV. As always, please do give us your feedback and don't hesitate to contact us and do support us. We are counting on it. SlashCV now works with the Dropbox API and lets you save copies of your resume directly to dropbox in a couple of clicks. You can now create multiple copies of your resume tailored to specific job roles and directly upload each copy to Dropbox. We have made this for you to have easy access to your resume on all devices =) We hope you like it. We have also removed demo, and changed the sign-up flow. 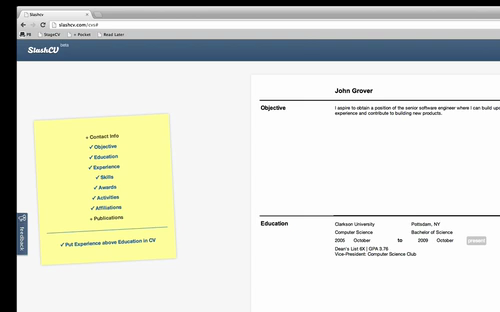 Now you can create your resume and view PDF without having to create an account. We have also removed the SlashCV watermark on the PDF for users who haven't signed up. However, we recommend you create an account if you want to come back to your CV and edit it later or even just to preserve a copy. ]]> Team SlashCV tag:blog.slashcv.com,2013:Post/74736 2012-12-25T06:54:00Z 2019-03-28T03:10:13Z Demo! We have included a small demo on our homepage for first time users. 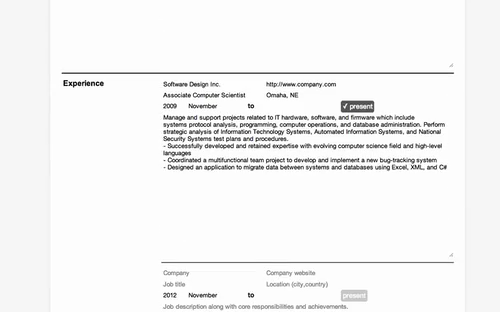 It gives a preview of the how the Edit CV form and the PDF works. Other updates include addition of page numbers to the PDF as pointed out by one of the users on the feedback forum. We have also made minor changes to the publications section in the Edit CV form, it now includes only two input fields - Name of the publication and Details. We are also working on multiple templates for the CV and will build it in the next couple of iterations. We have also included a contact email in the footer, please do not hesitate to contact us about anything related to SlashCV. As always, please use the feedback form to help us with ideas and suggestions. ]]> Team SlashCV tag:blog.slashcv.com,2013:Post/74738 2012-11-16T04:23:00Z 2019-01-26T23:16:18Z We are on Facebook! A Big Big Thank You! to all of our registered users on SlashCV. We sincerely thank you for taking the time to try SlashCV and for reaching out to us with feature requests, bug reports, comments and suggestions. We have been listening to you and have come up with a few improvements to SlashCV. We also have one feature update. You can now edit labels such as objective, experience or education etc., on your edit CV form (not on the left pane but within the form itself). Simply click on the label or section heading and edit. For instance you might want to replace Objective with Profile or Acitivities with Projects or Experience with Internships. It is possible now to do so and customize with a simple click. On the left pane under Edit CV, you can now see this option. When selected this allows you to emphasize your work experience over your education in your CV. Select it to place Experience above Education in the PDF version of your CV. To test, click on View PDF which is now located in the header. You can now manually save changes by clicking the save changes button. This should come in handy when you are making small changes to your resume. Changes are also auto-saved every 30 seconds. We have moved the username field from Account to Profile. Now it is easier to set your custom URL for your profile without navigating to the Account view. We have also changed the default profile image. We have made a few minor changes to the homepage to give a more consistent view of what SlashCV does. Along with these small changes we have one feature update and that is Feedback. Feedback lets you share the CV you just created with your friends on any social network or via email through a simple shareable link. Your friends can then view your CV and send you suggestions for improvement through a form. 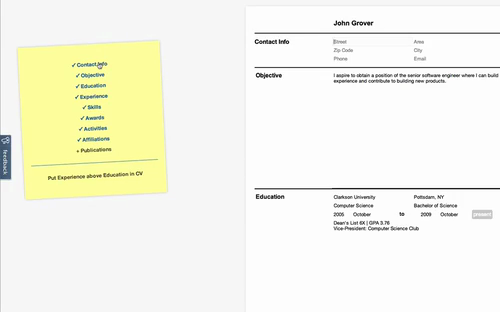 All the feedback is collected and shown to you in SlashCV, which you can use to make improvents to your CV. We also send you an email notification everytime you recieve new feedback along with the text of the feedback so that it is easy for you to follow through. That is it for now =) We will keep you posted with future updates here. Employers are far more concerned with knowing that you can make a real and positive impact on day to day operations than they are with reading a long list of responsibilities that only prove that you’re exactly the same as every other applicant. Concentrate on specifics. How did you better your workplace? How much money did your last project save the company? How did the new filing system you came up with help overall efficiency? Cite numbers and percentages and be specific. Don’t get lost in the crowd. If your resume shows you as an individual who contributed real benefits, you’re halfway there. You’ve worked hard during your career. There are so many things you want to say to an employer to prove your worth; however, including every last piece of your career story on a resume will get it thrown in the trash. Why? Recruiters and hiring managers read hundreds of resumes a week. They are looking for concise, accurate, and hard-hitting material that focuses strictly on the needs of the companies they work for. It takes thirty seconds or less for someone to skim over your resume and decide whether to throw it away or pass it on next stage. Don’t dilute your best stuff with pages of filler. A common problem when writing your resume, or even when having it done by a professional, is the hesitancy to sell yourself and embrace confidence in your abilities. If you can do it, then *own* it. If you’re good at it, make sure it comes out on paper. Don’t ever sell yourself short. The most important part of preparing for a resume is assessing and embracing your worth. The last place you want to come across as shy is in one of the most important professional documents you’ll ever own. Being enthusiastic about your selling points is one thing but exaggerating or outright lying are the worst things you can do for your career, your professional reputation, and your chances of employment. Your ability to do the things you claim to be able to do will be tested from the moment you start your new position. Before that, you’ll face employers who know how unfortunately common this tactic is and exactly how to expose it. Many industries have open blacklists that contain the identities of individuals who are caught using this tactic, ensuring that their chances of gaining employment elsewhere are reduced drastically. One common misperception is the idea that a single resume fits all scenarios. This is simply not true. One of the most powerful strategies when applying for different jobs is to tailor each of your resumes to individual opportunities or fields. If you’re an unemployed restaurant manager who has a lot of experience in fine dining, you’ll want to point that out when applying for that type of job. If you seek employment with a busy café, it’s better to generalize and showcase your managerial experience without mentioning that you’ve never worked in quite the same type of place. This isn’t lying; it’s providing only the most relevant information to each particular company. This is a crucial strategy. Using a one-size-fits-all format for your resume may work for some situations, but if you really want to pique the interests of an employer, you’ll need to use a little strategy when organizing your information on paper. If you’re just out of college, or applying for a job that requires a specific degree, place that information near the top of the first page, where it’s immediately obvious. If you want to call attention to your accomplishments, put them in bullet form and leave the basic responsibilities for an introductory paragraph. The correct formatting, highlighting, and placement of information is just as important as the information itself. If someone is skimming through your document, you want them to see your best material right off the bat. Modern resume writing strategies have evolved to accommodate the special keywords and phrases that are scanned for when submitting them to online databases and posting services. The keywords themselves will depend on whether you are targeting a broad career field or specific job listings. As with everything else in the resume writing arena, it all comes down to personalized strategy. This isn’t as necessary when handing your resume to an actual person at a brick-and-mortar company, but embracing online technology and resources is crucial for those seeking to reach as many people as possible with your intention to secure employment. Technically, this isn’t advice for the resume itself, but the power of networking cannot be understated. Talk to people, build relationships, and share mutual resources. If a manager isn’t hiring, give them your resume anyway and ask them to contact you if something comes up. If a friend works with a great company, ask them to introduce you to some people and have them put in a good word for you. They may remember you in the future. Join professional groups related to your career field; help others who are just below your rung on the company ladder. Make your presence known and people will remember your name. Many professional resume writers and recruiters are open to giving advice to people who need an honest and direct critique of their resume. Take advantage of this and be willing to make changes and adjustments, even if you don’t personally agree with them. What may seem like a small issue to you could make a huge impact in whether your resume gets passed on the next level, or whether you’re called for your first interview. Even a second or third pair of eyes from a family member or friend can help you identify weak areas or remember skills you almost forgot you had. A professionally written resume with a powerful and strategic approach can provide a return on investment that far outweighs the initial costs. Personal research and commitment to writing yourself a great resume will greatly improve your chances of finding the ideal position, but only a trained resume specialist can truly take your job search to the next level. If you’re serious about your career, you should strongly consider taking advantage of someone with years of experience and an acute awareness of the day to day evolution of resume best practices. We are happy to announce the public beta for Slash CV! 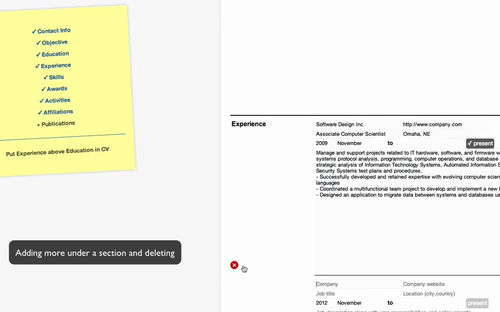 The Edit/CV form helps you create a resumé and generate a PDF that you can download. 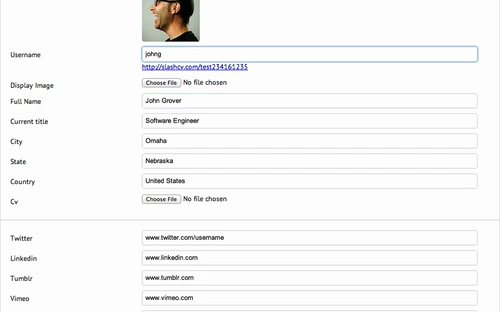 The Profile form can be used to create your profile with a personal URL <http://slashcv.com/username> where you can upload your existing resumé. Use the Account form to change email, password or username. All changes in the Edit/CV form are autosaved every 30 seconds. If you need to cancel your account, you can do so from Account settings. That's it! We have kept everything very basic and simple. Since we are in public beta, we will continue to make changes to the site depending on the feedback we get. Please use our feedback form to report bugs, suggest improvements or request new features. We will keep a log of all the changes and improvements here.